Satan's Greatest Weapon Is To Con People Into Living The Christian Life Without Being Born Again! Every sincere Roman or Orthodox Catholic is going to split the fires of Hell wide open and scream in agony, begging for mercy from the torment, flames and tongue-gnawing pain, but God will ignore them just as they ignored His Word for a lifetime on earth. You can get mad at me all you want to, it doesn't change anything. 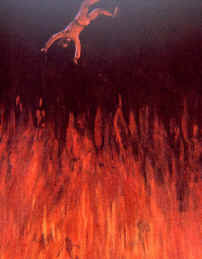 You will still burn in Hell if you die in your sins. I'm the best friend you have right now if you're not saved, because I'm telling you the truth to try to get you saved. You can get made at me if you'd like, but you're the fool, not me. Do you want to burn forever in Hell? A recent USA TODAY poll showed that 59% of Americans don't believe in Hell, and 74% believe in Heaven. Another poll, done by the Barna Research Group showed that 62% of Americans don't believe in a literal Devil'; but rather, think Satan is a mere symbol of evil. But, Satan has them duped! Ironically, world leaders and countless famous celebrities DO believe in Satan! Watch this Signs Of Satan video. Check out this article on the heavy-metal Satan-worshipping band, IRON MAIDEN. It's insane that the average working man denies the existence of Satan, while world leaders serve, worship and sacrifice to the Devil. I never though I'd be writing something like this, but heresy is creeping into our Independent Fundamental Baptist churches by the hour. It's really a misnomer because if they were truly “fundamental,” then they wouldn't be hobnobbing and following the Devil's ecumenical crowd. I've heard countless Baptist pastors, Bible college teachers and laymen say that it's not enough to admit that you're a sinner and believe the Gospel to be saved. They have been brainwashed and led astray by radio ministers and apostate authors like Joel Osteen, Max Lucado, Franklin Graham and Billy Graham. I look forward to the day of God's Word being vindicated in eternity, when all the Lordship Salvation heretics are proven frauds. Just as Roman Catholics are in denial, claiming that they don't worship the statue of Mary that they bow, adore and pray to continually; so also do many Independent Baptists falsely claim to completely trust Christ, while sincerely believing that they must commit to abstain from a lifestyle of sin in order to be saved. Where in the Bible are we taught that repentance means to “DIE TO CHRIST?” Where in the Bible are we taught that we must discard “OUR FORMER WAY OF LIFE” to be saved? That is Catholic teaching! In sharp contrast, Biblically we are saved by trusting Jesus, nothing else. Then as a Christian (once we've already been saved) God wants us to be crucified with Christ and die to the lusts and desires of the flesh. Please understand that the saved life and the crucified life are separate. If you combine the two, you have a corrupted Gospel, a false plan of salvation. Dr. Jack Hyles does a wonderful job explaining this truth in his awesome MP3 sermon titled, “STEPS TO SANCTIFICATION (OR THE ROOT OF ALL HERESY).” We are saved by trusting Jesus, period. Whether or not you turn away from the old lifestyle of sin DOESN'T keep you from being saved. Eternal life is a free gift (Romans 5:15; Ephesians 2:8-9). You can be saved by simply believing on Jesus Christ, that He died for your sins on the cross, was buried and raised-up from the dead three days later (1st Corinthians 15:1-4). This is not merely a matter of semantics. Either you have to cease and turn away from an old lifestyle of sin to be saved, or you do not. Either salvation is 100% completely of God's righteousness, imputed by faith solely in Christ (Romans 4:5-6; Philippians 3:9); or else it is by partial faith in Christ, plus our own human effort in departing from our sinful ways. The latter is rooted in the Roman Catholic understanding of repentance, and it is religion it its worst. Satan would love to get you to live the Christian life, without ever being born-again, deceitfully thinking that you are going to Heaven when you're not. YE MUST BE BORN AGAIN! (John 3:5-7). Remember, the most effective lie is the half-truth, because in part it can be defended with incontestable logic. It was prolific occult author and demonic 33rd degree Freemason Manly P. Hall who said that. He is absolutely correct! Satan knows that the most effective deception is one in which there is truth combined with a lie, so that the truth masquerades the lie. Hence, the Devil loves to lead people into religion—literally going through all the Christian motions of attending church, reading the Bible, singing, tithing, serving, praying, supporting missions, living for others, charity, et cetera—without ever being born-again from above by the Holy Spirit of God by completely resting in the Gospel of Jesus Christ to be saved. The lie (deception) is that you can get to Heaven by living the Christian life. The truth is that every believer is supposed to let God live the Christian life through them (Galatians 2:20), which if you're not aware, can become a false plan of salvation in itself, which is what Lordship Salvation is all about. Satan has substituted Christian living for the new birth. We don't hear enough preaching in today's churches about being “born again,” and what it truly means to be born-again (1st Peter 1:23). Romans 10:3-4, “For they being ignorant of God's righteousness, and going about to establish their own righteousness, have not submitted themselves unto the righteousness of God. For Christ is the end of the law for righteousness to every one that believeth.” God does the saving—all of it! I am proud and thankful to be an Independent Fundamental Baptist. That's the only type of local church that I would attend or recommend, although there are some good churches that are non-denominational, et cetera. I don't recommend any Presbyterian churches because they all teach sacraments, which are unbiblical. Churches of Christ are demonic, requiring water baptism for salvation (a heresy known as Baptismal Regeneration). Most of your non-denominational churches are corrupted, using modern perversions of the Bible, they are worldly, and false doctrine has crept in. Sadly, it's getting so bad in the United States that you cannot count on Independent Baptist churches anymore to exemplify the New Testament Church. The satanic plot of 501c3 licensing from the state was intended from its inception to regulate and control the churches, forcing them to comply and remain silent concerning a corrupt police state government. The state can license a 501c3 business entity, but they can NEVER license the redeemed church of the Lord Jesus Christ. The government is nothing! Beware of Baptist churches that are starting to teach the Lordship Salvation heresy. Billy Graham teaches Lordship Salvation. Do your research and you will find, that Billy Graham has been having spiritual love affairs with the popes of Rome for a half-century. James 4:4, “Ye adulterers and adulteresses, know ye not that the friendship of the world is enmity with God? whosoever therefore will be a friend of the world is the enemy of God.” No one single individual has done as much damage to the cause of Christ than Evangelist Billy Graham, who has built a bridge of ecumenical apostasy and has led tens-of-millions of professed Christian evangelical churchgoers into sympathy, cooperation and involvement with the satanic whore of Roman Catholicism!!! The pope is the vicar of Hell!!! The Catholic church is straight out of the pits of Hell!!! Chip Ingram, Ray Comfort, Paul Washer & Jehovah's Witnesses Agree! So, what does "accepting" Jesus really mean? Is it a one-time act of faith, or is it a continuing way of life? Must our belief be strong enough to motivate us to action? Can we really accept the benefits of Jesus' sacrifice without the responsibility of following him? Salvation is a free gift from God. It cannot be earned. Yet it does require effort on our part. "If belief is all that is necessary for salvation, then the logical conclusion is that one need never repent. Thus, "accepting Christ" involves far more than just accepting the blessings that Jesus' superlative sacrifice offers. Obedience is required. ... So we must do more than simply hear and believe. Without works to demonstrate our faith, our claim to follow Jesus would fall far short, for the Bible clearly states: "Faith, if it does not have works, is dead in itself." —James 2:17. In sharp contrast to what ALL these wicked men who have erred from the faith are falsely teaching, the Word of God teaches that Biblical salvation is obtained only by believing on the Lord, that is, receiving the Gospel of Christ's death, burial and resurrection as full-payment for our sins. That's it! Eternal life is a free gift to those who believe that Jesus is the Christ, the Son of God Who came into the world to save sinners; being crucified, buried and risen, and you make that your hope for Heaven. It's not that hard to understand the concept of a “gift.” What if I were to buy you a birthday gift, show it to you, and then I ask you to wash my car and mow my lawn before I give it to you? Would it still be a gift? Of course not! It would be something that you earned, or a reward that you deserve. I marvel at the theological ignorance of many pastors today, who talk out of both sides of their mouth. On one hand they unequivocally state that eternal life is a free gift, made available through Christ's sacrifice on the cross, by God's grace, that cannot be earned; while at the same time talking out the other side of their mouth, saying that a person's faith is invalid unless there is a forsaking of sinful living, full surrender to Christ as Lord, confession before men and intent to reform. The double-tongued theological garbage that I just mentioned is what all Lordship Salvationists teach (in one variation or another)! This is what the religious cults teach too! The heresy of Lordship Salvation is just as absurd as offering someone a birthday gift only IF they wash your car and mow your lawn. Satan's greatest weapon is to con people into living the Christian life without ever being born again! Billy Graham's website adds a bunch of extra requirements to be saved, requiring people to count the cost, surrender to Christ by a definite act of the will, and allow God to change your life. These are NOT Biblical requirements for salvation! Mr. Graham has confused discipleship with salvation. First, you must recognize your need. Second, you must understand the cross. Third, you must count the cost. He also said, “Which of you, intending to build a tower, does not sit down first and count the cost? … So likewise, whoever of you does not forsake all that he has cannot be My disciple” (Luke 14:28, 33). Many people come to Christ without first counting the cost. The cost includes repentance, the forsaking of sin, and a continual, daily, open acknowledgment of Christ in your life. Fourth, you must take a definite step. One day at Stanford University, a student of a non-Christian faith came to me and said he was convinced that Jesus is the Son of God but said he couldn’t confess Him publicly. He said that back in his own country the cost socially would be too great. I had to tell him that the Bible says: “Whoever confesses Me before men, him I will also confess before My Father who is in heaven. But whoever denies Me before men, him I will also deny before My Father who is in heaven” (Matthew 10:32-33). Like the rich young ruler of old, the student went away sad. He had counted the cost and was not able to pay the price of open acknowledgment of Jesus Christ as his Savior. We ask people to make a public confession of Christ in our meetings because Christ demanded a definite commitment. Christ had reasons for demanding that people openly follow Him. He knew that an unwitnessed vow is no vow at all. Until you have surrendered to Christ by a definite act of your will, you are not a Christian. Billy Graham has confused discipleship with salvation. You just read it! Many of the chief rulers believed on Jesus, but due to fear of being kicked out of the synagogue, DIDN'T tell anyone that they were saved. They hid their faith from others. According to Billy Graham's false Gospel, these men were not saved. According to Billy they weren't willing to pay the price of confessing Christ publicly, so they weren't saved. Isn't that a bunch of nonsense that Billy Graham is dishing out! Billy Graham is paid $633,722 a year, to lead people into the fires of Hell, by getting them to live the Christian life without being born-again!!! Ladies and gentleman, that is a false gospel of works salvation!!! Billy Graham is of the Devil. In Luke 18 Jesus used the law the way it was intended to be used, that is, as a measuring stick to show this young man that he was not as perfect as he thought. The rich young ruler said to Jesus... ALL THESE [COMMANDMENTS] HAVE I KEPT FROM MY YOUTH UP! Jesus pointed out that he had failed to keep the commandment against covetousness! The Lord WASN'T giving him a plan of salvation; but rather, Jesus was using the law as intended to show the rich young ruler his sinnership, guilt of sin, and total inability to save himself. The END OF THE LAW IS CHRIST (Romans 10:3-4; Galatians 3:24-26).